For New Orleanians of a certain age, weekend meals shared with our families at the many casual West End seafood joints and daily lunch plate specials nabbed from Mom-and-Pop neighborhood restaurants were the norm. Opened last fall, Susan Spicer’s Rosedale feels at once fresh and new, familiar and comforting. Though the only “body” of water within walking distance of Rosedale is a drainage ditch, I still felt the tug of memories of the old Katrina-vanquished Sidmar’s, which was nestled on a narrow strip of land between Lake Pontchartrain and the 17th Street Canal. The tone for the experience is set before you even open the door at Rosedale. The exterior of the small wooden clapboard building, a former police station, remains deliberately devoid of a fresh coat of paint, allowing it to blend seamlessly with the rest of the Navarre neighborhood. Inside, there’s a large bar, rustic décor and the waiter’s station is situated within one of the former jail’s cells; the bars that once restrained the unruly are still present on the window. Though Spicer owns Rosedale and brings her star power to the game, it’s fitting that she appointed her long-time second-in-command at Bayona, Brett “Shaggy” Duffee, to head up the kitchen. This is the kind of unpretentious place where a guy named Shaggy seems like just the right call for the kitchen. The menu successfully merges familiar New Orleans neighborhood restaurant standards with global influences. 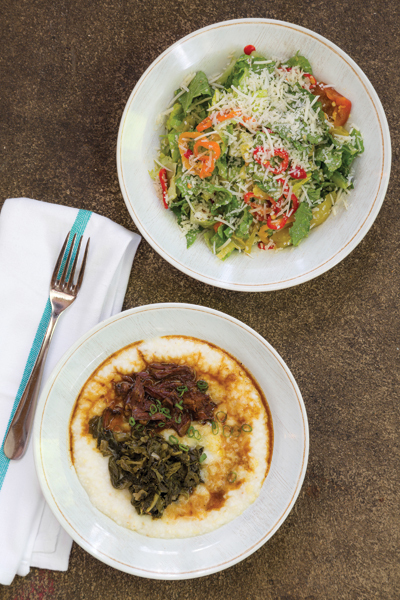 For starters, eggplant Caponata is served with croutons and creamy Burratta; the chopped salad is finished with a velvety house-made Pecorino dressing; and bowls of Cheddar-laden stone-ground grits are offered with an array of toppings including smothered greens, broccoli, sautéed mushrooms, barbecued shrimp, cochon de lait and short rib debris. Entrées include a play on the classic muffuletta with seared cold-smoked tuna; and the ever-comforting spaghetti and meatballs is leavened with the use of lamb, ricotta and spicy Calabrian breadcrumbs. Remember those little cherry-topped single-serving pineapple upside down cakes and rum cakes that were always in the McKenzie’s pastry case? There is a rendition of that here, too only the pineapple is kissed with an exotic touch of mango. Across town, JoAnn Clevenger, James Beard Award Nominee for Outstanding Restaurateur maintains the standards for excellence she first established when she opened Upperline in 1987. The restaurant’s signature dishes have become local standards and are frequently imitated, most notably the fried green tomatoes with large, plump Gulf shrimp coated in a bracing remoulade sauce. Throughout the year, to keep things fresh and interesting, Clevenger offers several special dinners and celebrations. She put garlic on a pedestal long before others embraced the “stinking rose.” Originally a creative whim, Upperline’s Garlic Festival has been celebrated every summer since 1987. It will kick off once again beginning in June and will run through the end of August. For those less adventurous (or simply on a date and not seeking the odious charms of Nature’s Chaperone), Upperline’s regular menu will remain on offer during the festival. As festival season plunges on and house guests continue their descent, feeding them can become a challenge. Consider The Chubby Biscuit from chef Shelley Everett. It is an entire grab-and-go meal, in a biscuit. The Tremé-based Southern chef behind Gourmet Angel Catering learned her biscuit techniques from her grandmothers and evolved them to offer both sweet and savory, super-sized selections, including The Crescent City (crawfish and Andouille sausage), Muffuletta, The Gotham (tomato, basil, Parmesan and truffle oil), Bacon Cheddar, The Frenchmen (apple-wood smoked bacon, Stilton and pears), Chubby Hubby (chocolate, caramel and bacon), The Italiano (salami and Gorgonzola), Smokey n’ Bandit (smoked salmon and egg), and The James Bond (pulled pork with chocolate jerk sauce). Chubby Biscuits are available at the French Market on the Esplanade side, through pop-ups around town (check Facebook) or you can have an order delivered to your door.